The sallet farmed in one, piece with a rounded crown rising to a low medial keel and encircled at its base by a series of round-headed lining-rivets, moderately long tail, broad stepped vision-slit, and angular outward turn at its lower edge, struck at the front right of its brim with an armourer's mark representing a crossbow bolt; the associated bevor formed of three medially-ridged, articulated plates respectively covering the face, the chin and the throat, the first having a narrow outward turn at its upper edge accompanied by a series of holes for lining-rivets, the second fitted at the right of the chin with a spring-catch to support the first, and flanged at its lower edge to receive the third which descends to a deep central point pierced with a pair of lace-holes. The graceful contours of this fine sallet and bevor immediately identify them as products of the high 'Gothic' era, when the craft of the armourer, in southern Germany in particular, reached what many would regard as its highest point. 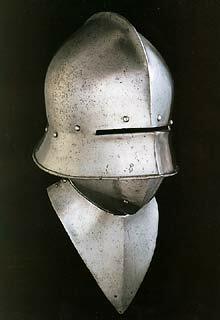 Although sallets were evidently used in Germany from as early as the first quarter of the 15th century, it is only in the middle years of the century that a distinctively German form of sallet first appeared. Probably inspired in part by the contemporary kettle-hat, it initially exhibited a somewhat bell-shaped form with a deep brim that was drawn out to a short tail over the nape, and cut with a vision-slit at the front. By about 1470 its tail had been slightly lengthened to produce the classic 'sou'wester' shape seen in the present pleasingly proportioned example. 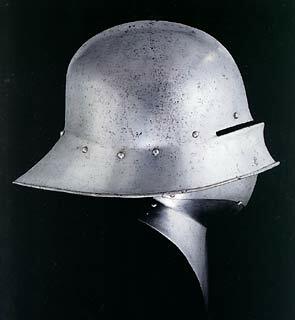 Although one-piece sallets similar to that shown here continued to be made until very nearly the end of the century, the tendency after about 1480 was to equip the German sallet with a movable visor in the western European fashion. The present sallet, with its one-piece construction, its relatively short tail, its strongly convex lower edge and its narrow medial keel, can be counted among the earliest surviving examples of the 'sou'wester' type, made about 1475. 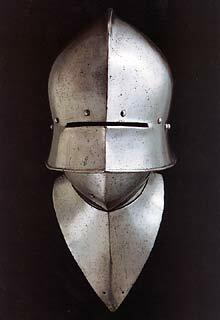 Sallets of a similar form and date are recorded in the Metropolitan Museum of Art, New York (Ace. Nos. 19.25.576 & 04.3.229), the latter bearing the mark attributed to Adrian Treytz the Elder of Innsbruck; the Hessisches Landesmuseum, Darmstadt, and the Collezione Odescalchi, Rome (Inv. No. 760), both bearing marks attributed to the same maker; the Royal Armouries Museum, Leeds (Inv. No. 429), bearing the mark attributed to Christian Treytz of Innsbruck; the Bayerisches Armeemuseum, Ingolstadt (Inv. No. 11778), bearing the same maker's mark; the Philadelphia Museum of Art (Cat. Nos. 44 & 45); and the British Museum, London. Such sallets would normally have been accompanied, as here, by an articulated bevor that protected the wearer's lower face and throat. In the case of the present example, the wearer could, if he desired, have obtained extra ventilation when not in action by depressing the sprung stud at the right of the chin to allow its upper plate to be lowered. 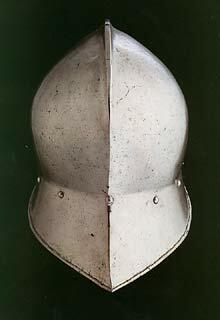 Although its flowing lines convey an impression of lightness, the sallet shown here is in fact very solidly constructed with a crown of sufficient thickness to withstand the heaviest of blows. The deep drawing of such a sallet from a single heavy plate called for the highest level of skill from the armourer. Glad to see more topics dealing with armour, not that there is anything wrong with all the emphasis on swords, but it is good to stir things up a bit as sometimes people seem to forget that ALL arms and armour subjects are allowed and even wanted on these forums. Anyway, a good read, thanks. Thanks very much the piece about this sallet.I have been admiring this particular sallet for some time now,ever since I first saw it in the Christies sales catalogue ( December 12th 1997) .It is very much on my list of things to make for ' fun',as soon as I have a chance ! Even better here is the fact that you have a superb view from the back as well. Great stuff ! Do you by any chance know of its present whereabouts ? I don't know the current whereabouts, but it was being offered for sale by Peter Finer in 2002. Thanks Nathan.I'll have to start getting the catalogues from Peter Finer !! Like the 'Flemish' armet,he does have some really superb and unusual items for sale.This sallet and bevor was estimated at £ 70.000 - £100.000 in the 1997 Christies auction catalogue ! 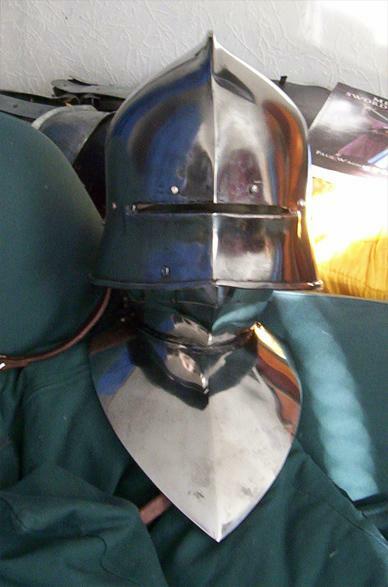 with a lesser Italian export example (sallet only),estimated at £40.000 - £60.000. Does anyone know by any chance if 'Arbour Antiques' are still in business ? Based in Stratford-upon-Avon,they too had some wonderful items for sale,but with the passing of the late Robin Wiginton I do not know if they are still trading. Another really fine piece. Judging from the narrow and rather refined taste and execution of the etched decoration ,one might possibly think of this as perhaps coming from one of the Augsburg workshops ?? Helmschmieds perhaps,though at this date it would have been Koloman and not Lorenz that was head of the workshops,Lorenz having died in 1516. What is really interesting,especially for those who have not been so lucky to get the chance to examine originals, is just how 'squiffy' the lines etc. of some of even the finest pieces sometimes are.We modern armourers spend too much time trying to get all the lines etc. even and parallel,when all too often the original armourers didn't bother too much themselves! Like the way the bowel of the sallet is slightly higher twords the medial ridge on the right side than the left in the shot from the rear or the little hook to the right the ridge takes at the very point of the tail . Does the comb on the burgeonette stray to the right a little as well ? Maybe its the lighting but the helm seems to "angle" to the right . Arbour Antiques is still showing up when Google'd, so I guess it's still in business. Sorry to hear about Robin; he was a collecting aquaintance of mine, but I haven't been in touch for a long time, so the news of his passing caught me by surprise. Sorry to have been the bearer of bad news.Regrettably Robin passed away in April 2002. A great shame , he was a true gentleman.Whenever I was in Stratford Poets Armour was always the first place that I made for ,and I am sure that most people used it as a museum and not as a shop,but thankfully,that never seemed to trouble Robin. I tried Google,but though it mentions Arbour Antiques in many posts I couldnt find anything specific about them.I'll have another look. Digging up this old thread since it seems most appropriate to post this in. A friend of mine had a reproduction of this helmet made by swedish armourer Albert Collins and we went to pick it up just a few hours ago. So i though id share some pics i took of this wonderful gothic beauty. Do you know if the repro is raised in one piece of metal or if it is made of two parts welded together? You are totally right. I was looking at a late 15th couter the day before last and there were a number of things that gave it character, the punchwork asymetrical and such. It was a nice piece though. I was very suprised by the thickness-thiness. THe outside was fairly thick 2-1.4mm ish while the inside closer to 1-1.2mm I would say. A very carefully made piece. Albert Collins usually does helmets from one peice, but this one is actually not made that way. I think the waiting-time was a factor in ordering a two-peice helmet, since Albert is a busy man and making such a helmet from one peice would have taken far longer. And about the "squiffy" lines mensioned earlier; i have to say that after seeing Albert Collins work up close he is truly a master of that authentic feel. His things have strong charachter and i think he really focuses on what armourers focused on back in the day.